Emerge as the times require, the 7 in 1 multi-functional emergency survival rescue knife is what you need. 1, High quality ultra-sharp 440 stainless steel partially serrated blade. 2, Lightweight and strong anodized aluminum handle. 4, Magnesium alloy fire starter, bring you light and warmth when under an unexpected situation. 5, Glass breaker and seat belt cutter make the knife an invaluable survival and rescue tool when on accident. 6, Quick assist thumb stud for easy one handed operation. 7, Pocket clip for easy carry around. Reminder: We provide LIFETIME WARRANTY, just click "ADD TO CART" confidently, you are choosing A MUST HAVE all in one survival tool for disaster preparedness & emergency escape, don't be hesitated to buy. MULTI-TOOL: 7-in-1 pocket-size stainless steel survival knife, which combines a blade with serrated saw, a bottle opener, a LED flashlight, a magnesium alloy fire starter, a blade lock, a glass breaker, a seatbelt cutter, whistle and a pocket clip, very handy tool for hiking, hunting, camping, fishing, military, search and rescue, or everyday tasks. QUALITY GUARANTEE: No matter the stainless steel blade, or the glass blade, we always make this survival knife by high quality materials, so we confident to provide a lifetime warranty. 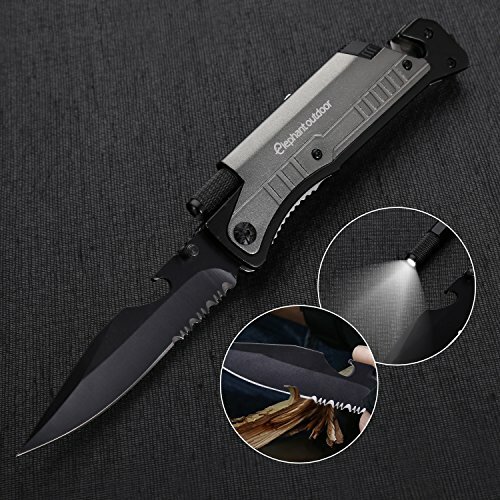 CUSTOMIZED DESIGN: It has many designs for convenient use: a 4 inches blade with PARTIALLY SERRATED EDGE for slicing and cutting, a liner lock for security, a QUICK ASSIST THUMB STUD for quick and easy one hand operation and a POCKET CLIP for everyday carrying. It is designed for all occasions such as home fruit knife any outdoor activities. EASY TO USE AND STORAGE: The knife is only 5 inches when fold, can be easily held on your palm, very easy to carry and storage. The blade is 4 inches long, and the whole unit weighs only 5.3oz, carry by the belt clip or put into your pocket easily. LIFETIME WARRANTY: There are so many options around the market, but customers always feel difficult to make a decision. DON'T WORRY, we always make things easy because we provide 100% QUALITY GUARANTEE and 100% risk free MONEY BACK GUARANTEE. When concern with survival gear, you can trust us and click "Add to Cart", you will glad to own it. If you have any questions about this product by Elephant outdoor, contact us by completing and submitting the form below. If you are looking for a specif part number, please include it with your message.